Buying this will earn you 3 MongoMoney worth €3! 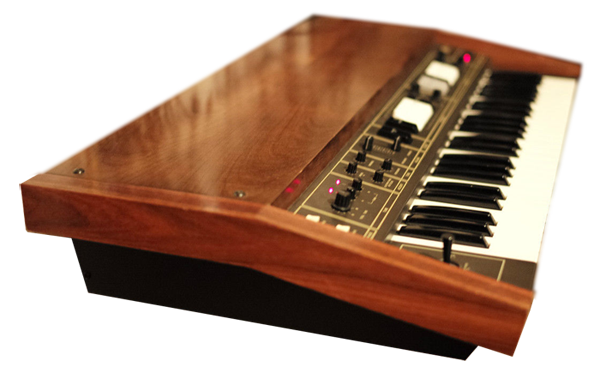 First produced in 1979, the Korg* Lambda ES50 was a monumental wedge of polished wood and analogue electronics designed to take the string synth concept to a higher level. It distinguished itself from string synths that had gone before on a number of fronts: it was fully polyphonic, not paraphonic; it had a host of real-time tonal and envelope controls over the sound; it combined string and ensemble sounds with key sounds like pianos, EPs and clav; and most of all, it included a rich, analogue, swirling, stereo chorus effect. This fact alone set it head and shoulders above its contemporaries. 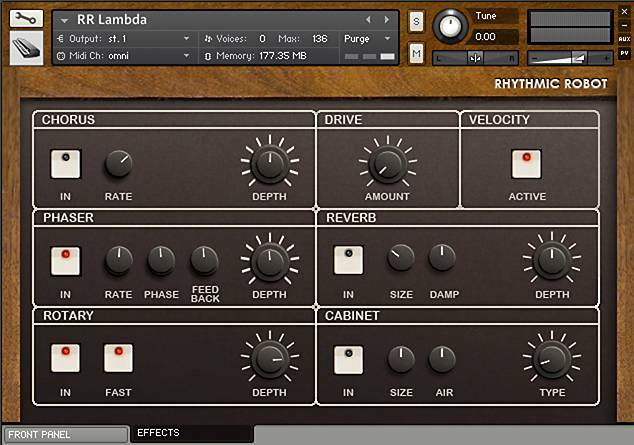 The Lambda’s chorus (which it calls “Chorus Phase”) makes for a superbly lush, expansive sound, thickening the strings and other patches, filling out the soundstage, and warming a whole mix with a single button-press. It’s a little touch of analogue magic! The tones are a great selection of sounds. The Lambda divides its tones into Percussive (for which read “keyboard”) and Ensemble (for which read “orchestral”). On the Percussive side of the panel we get a great EP, a nice sharp Clav sound, a thick and funky Piano, and a very useful high-pitched Harmonics sound that combines well with the other sounds. There’s also a Key Click control for the EP hidden away, to give its attack more bite. On the Ensemble pane we have Brass, Organ (as in church organ), Chorus (a wonderful, delicately smooth Vox Humana-type sound), and twin String tabs set an octave apart. These can all be combined freely to get some really complex tones going. The Lambda also incorporated twin detunable oscillators for some of its tone production, which allows a second, distinct way of fattening and thickening a sound. Naturally, the detune and the “ensemble” chorus can be selected simultaneously. This is pretty cool. Add in an entirely separate resonant filter responsible for giving the Brass patch its characteristic attack “wow”, a Tremolo control for the keyboard-style sounds, and a Vibrato control, and you’ve got a surprising number of tone-sculpting tools built right in. The Lambda is a machine that bridges the gap between preset string synths on the one hand and programmable analogue polysynths on the other: it lacks the full control of a polysynth, but goes far beyond what string synths had considered necessary. The result is a hugely usable keyboard which spans a wide tonal territory: thin to thick, sweet to rich, percussive to smooth. The single biggest advantage of the Lambda is its sound. The combination of detunable oscillators and that wonderful warm ensemble chorus is a winning recipe. When we set out to recreate the Lambda, we knew that that was the part we had to get right. We’ve sampled every tone of the Lambda both with and without the ensemble chorus, and with and without the onboard Vibrato effect, at one-tone intervals across the whole keyboard (and beyond, because we used the Octave Down button on the original to get to lower tones too). In all this comes to over 740 individual samples – long samples, too, to capture the evolving complexity of the Lambda’s tones. To take the instrument further in its capability we’ve expanded its control set. Instead of relying on simply switching the sound tabs in or out, you can now balance them with individual volume controls – this alone expands the range of tones you can get from the Lambda exponentially. We’ve also broken out the Ensemble chorus and Vibrato controls so that they’re individually-switchable too: on the original, these controls apply to either the whole Percussive section or the whole Ensemble section globally. Not any more! We’ve also created detuned versions of tabs that previously didn’t have the detune option. Finally, we’ve given the Ensemble section a proper ADSR envelope, and added Emphasis (resonance) to the filter circuit, which also has an ADSR of its own. With these modern controls bolted onto the Lambda’s vintage tone, you can create far more ambitious sounds than were possible on the original machine. 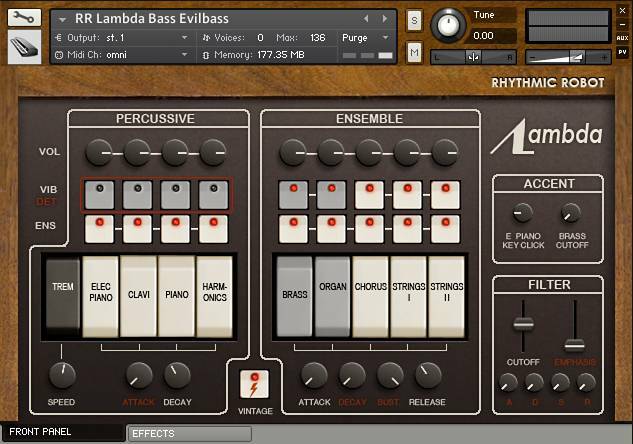 We’ve also included a selection of effects which cover the kind of ground that really suits the Lambda’s sound. Additional Chorus, a Phaser, and Reverb help seat the sound; Drive, a Rotary speaker model, and eleven amp cab models help craft it or roughen it up a bit. The rotary speaker and amp cabs in particular can really make the Lambda sound like it’s live on stage. Of course, you may want to limit yourself to the abilities of the real deal in order to create patches that are indistinguishable from sounds created on the 1979 original. We’ve got you covered. Using the same clever technology we pioneered on Jennings, we’ve included a Vintage Compliance mode in Lambda. Just click on the Vintage button and the control set will restrict itself in real-time to abilities and settings that conform to the original instrument. All non-authentic controls are “redded out” and won’t work; the Ensemble chorus and Vibrato controls only operate in banks, rather than individually per tone, just as on the original; the Volume controls are similarly ganged together to recreate the action of the twin original Volume sliders (one per bank). You get the picture: if you want authenticity, you can get to it with the press of a button. 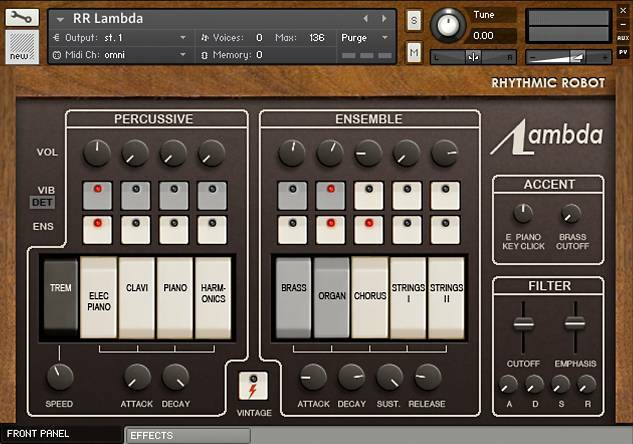 Lambda brings the richness of a real 70s polysynth into your mix. With lush stereo chorus, richly erratic detuned oscillators, and banks of classic tones that pack real vibe, this is analogue at its best. * Rhythmic Robot Lambda is developed by us, independently and is in no way affiliated with KORG Inc. Japan. (All our Kontakt instruments require a full copy of Native Instruments Kontakt v4.2.3 or higher (including all versions of Kontakt 5). Kontakt Player is not supported: instruments will load, but will time out after 15 minutes. See the FAQ for further information.) You can read more about the original hardware Korg Lamdba here. Like so many of the RR plugs, you know what its liable to do, and when it’s not doing it, you can figure out how to get it there… or you can’t, in which case, it’s your fault, cause you chose a blender to do the job of an electric knife. In other words, this plug does what it does well. It’s up to you know to get a good understanding of what that is, but it’s not going to let you down. It’s like Ducky in Pretty in Pink. I really liked Lambda and have used it for the bass line on this published track. It’s always easy to fall for the slick demos that others can create for instruments but for this one it just worked. As soon as I auditioned the sound I knew it was just what I wanted – something really organic I felt. I sat in for a fellow keyboard player using his equipment many years ago. His rig was built up around a Lambda (and other keys). I remember being so impressed with the thick sounds and that awesome ensemble effect. You guys have nailed the sound and the non-traditional bonuses you added are great. This is another winner in your ever expanding product line of quality (and quirky) Kontakt instruments. Kudos! I have a Korg Sigma, and someday I’ll get a Lambda. While I wait I can use this wonderful ‘Virtual’ one, very handy in the studio. I own an embarrassing amount of Kontakt instruments…many very good emulations…Lambda does not “feel” like a Kontakt instrument- there doesn’t seem to be anything between the sound and the way it feels to play the real thing. THAT kind of programming and interpretation is rare! The boys in the RR Lab have out done themselves in creating Lambda. It plays like hardware….and of course, it sounds magnificent. I really like Lambda. When I am in the middle of writing I really like thing that are easy to dial in. Lambda gives me that. AND the sound is there … of course.